Ready to be pushed BEYOND THE BOUNDARY (境界の彼方)? Death escapes those who wish for it most. The worst comes when you know you are a monster of the most horrific form and yet cannot control yourself nor cease your own existence. 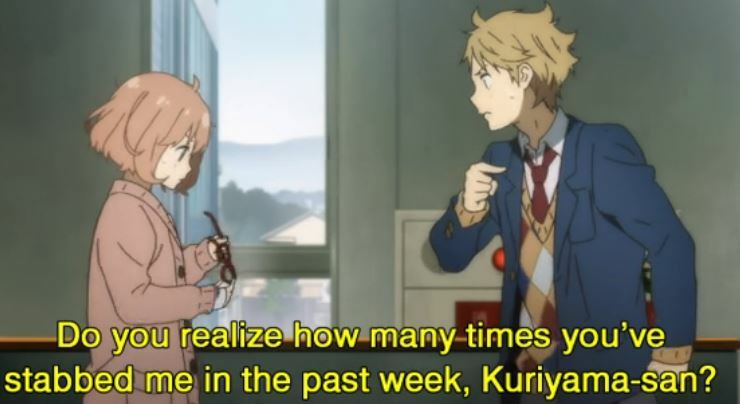 Beyond the Boundary explores the similar nature which represents much in the western comic stylings involving lack of the ability to control powers while having to live with the consequences, with the adorable twist of anime kawaiiness. Is that a suicide in the first scene? 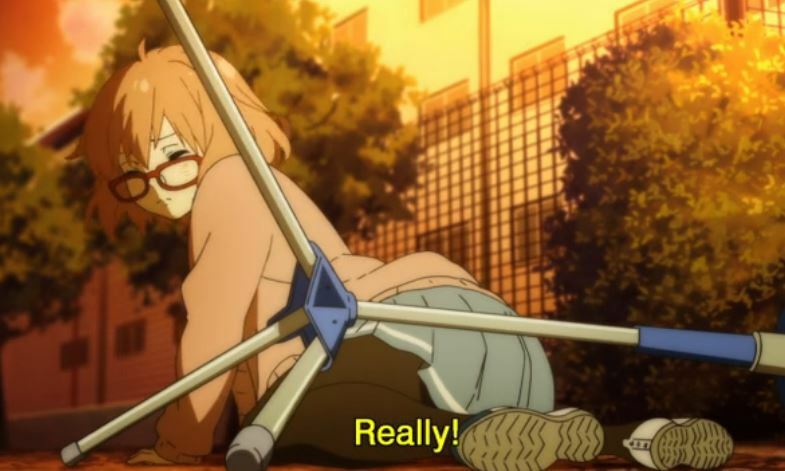 Kuriyama Mirai, a megganeko, has no plans for that as she couldn’t even if she wanted to. Oh, she wants to but cannot. Perhaps. Be ready for the bloodiest, sappiest, most sweet tale of friendship and bonding and stabbymcstabbing which starts with a sword through the gut of Kanbara Akihito, a megganekko fanatic. Don’t panic, he can’t die either. Perhaps. Translated: Ikihito likes girls who wear glasses ala Mirai. In a world where humans intermingle with and can be born as spirit world warriors (typically genetic), and can crossbreed with youma (aka: “demons” or “spirits originating not of this realm”), the mixed breed Akihito faces each day as though it were just any other typical day. As a member of the literary club, Akihito hides away in the club room after school with his childhood writer friend, Nase until Mirai becomes obsessed with using him as a training tool. Mirai with her ability to control her own deathly-to-others blood fears harming others, for she knows the pain which that causes, chose her target wisely. Akihito, as he’s half youma, is blessed with the ability to regenerate after being wounded among his many ferocious abilities and therefor makes a sensible practice opponent. Akihito is also quite congenial about the whole shebang so while still wishing Mirai would knock it off he handles himself towards her with compassion. Compassion…rage… they are the same thing in animation and all monsterous relationships, no? Wow, talk about fanfare for the etchi. Episode 6, as described within the episode. Due to the short nature of the light novel series, I don’t expect this series to move into the lengthy realm of Fairy Tail or Gintama and though I have not yet watched the last episode (it’s better I write this before I do) I could easily see this series reaching far and vast into the fandom territory of those who enjoy a multitude of distinct and exclusive genre.